With our audit services, you can confidently be sure that your financial statements will provide full transparency on information for financing, bonding, state and federal certifications, sales, mergers, and acquisitions. Kopin & Company, CPA, PC provides audit and compliance review services for Buffalo, NY area businesses. Our auditing and assurance services are designed with one goal in mind: provide decision makers with the necessary information to make well-informed decisions. With our audit services, you can be confident that your CPA firm will test the validity of financial statements and provide full transparency on information regarding the purchase or sale of a business. 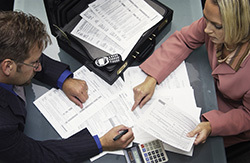 We also provide audit services for non-profit organizations. If your company does not already have a well structured picture of its current financial position and performance, we can help prepare a formal financial statement. Kopin & Company, CPA, PC will evaluate your organization’s processes for risk management, internal control and corporate governance. We provide routine compliance review services to make sure your business is adhering to reporting and recordkeeping requirements as set forth by the IRS. Our firm provides the financial analysis necessary to mitigate risk and enhance the quality of information used during business acquisition, mergers and more. If you're looking for a quality Buffalo CPA firm to provide reliable audit and assurance services, call Kopin & Company, CPA, PC today at 716-839-4556 to schedule your free initial consultation.